Group 17 of the periodic table contains the elements fluorine, chlorine, bromine, iodine and astatine. These are collectively known as HALOGENS. It is derived from two Greek words Halo and Gens meaning "Salt producer". Because most of them exist in Sea water. 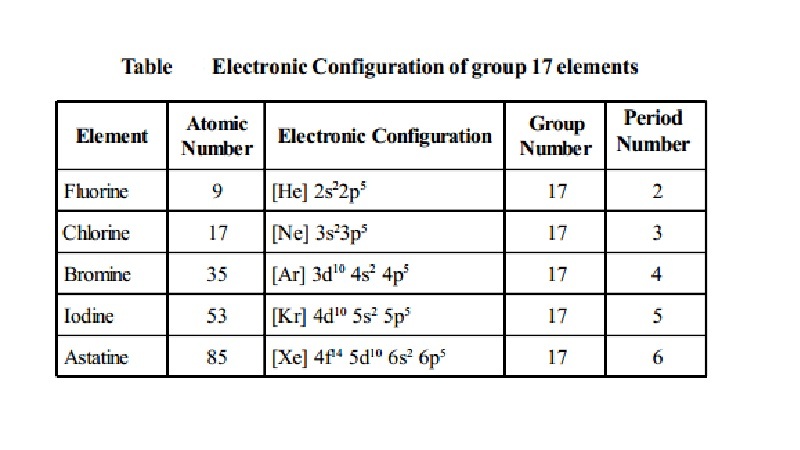 Electronic Configuration: All these elements possess ns2np5 configuration. property which is due to high electron affinity of halogen atoms. The oxidising power decreases from fluorine to iodine. Fluorine is the strongest oxidising agent. It oxidises other halide ions to halogens in solution or when dry. Halogen of low atomic number oxidises the halide ion of higher atomic number. considerable extent in a polar solvent like water. However, fluorine reacts with water readily forming a mixture of O2 and O3. Chlorine, bromine and Iodine are more soluble in organic solvents such as CCl4, CHCl3 and produce yellow, brown and violet colour. i) All halogens react with hydrogen to form volatile covalent hydrides of formula HX. ii) These hydrides are called hydracids. iii) The activity of halogens towards hydrogen decreases from fluorine to iodine. Hydrogen combines explosively with fluorine even in dark. It combines with chlorine in the presence of sunlight and with bromine on heating. Hydrogen combines with iodine on heating and in presence of a catalyst. iv) Hydracids are the reducing agents. vi) The acidic character of HX are in the following order. HF < HCl < HBr < HI. the hypohalites and halates respectively. due to the hydrogen bonding. Hydrofluoric acid is a weak acid whereas the other hydrohalic acids are strong acids. salts with metals. NaF and NaHF2. is soluble in water while the other AgX are insoluble. form any polyhalides. Thus we have I3 -, Br3-, Cl3- ions but no F3- ion. concentrated H2SO4 in a lead vessel. glass. The glass article is first covered with a film on wax. The design to be etched is now drawn on the waxed surface and is then exposed to the action of hydrofluoric acid. Now the glass can be very soon etched. The wax is finally washed off with turpentine. Fluorine does not occur free in nature. It occurs in the combined form. Dennis' Method: This was devised by Dennis, Veeder and Rochow in 1931. In this fluorine is prepared by the electrolysis of fused sodium or potassium hydrogen fluoride (perfectly dry) Electrolysis is carried out between graphite electrodes in a V-shaped electrically heated copper tube. The ends of the tube are covered with copper caps into which the graphite electrodes are fixed with bakelite cement. The copper tube is thickly lagged to prevent loss of heat. Fluorine liberated at the anode is passed through the U-tube containing sodium fluoride. Thisremovesthe hydrogen fluoride vapourscomingwithfluorine. 1. Fluorine is a gas and has pale greenish yellow colour. 2. It has extremely pungent and penetrating odour. 3. It is heavier than air. Fluorine is the most active member of halogen family. burn in fluorine forming fluorides. 3. Action with metals: It reacts with metals forming corresponding fluorides. common, freon is known as dichlorodifluoro methane CF2 Cl2. 2. CaF2 is used as flux in metallurgy. 4. SF6 is used as an insulating material in high voltage equipment. 5. Teflon is used as container to store hydrofluoric acid. 6. UF6 is used in the separation of U235 from U238. known as interhalogen compounds. The less electronegative element is written first. In naming also, the less electronegative element is mentioned first. They are divided into four types. AX : CIF , BrF ,BrCl, ICl, IBr. They can all be prepared by direct combination or by the action of a halogen on a lower interhalogen, the product formed depends on the conditions. difference, and the melting and boiling points increase as the difference in electronegativity increases. because the A-X bond is weaker than the X-X bond in the halogens. The reactions are similar to those of the halogens. Hydrolysis gives halide and oxyhalide ions, the oxyhalide ion being formed from the larger halogen present. Interhalogen compounds are generally covalent compounds in which the larger halogen forms the central atom. 1. Type AX. As excepted, the compounds of the type AX are linear. Thus CIF, BrF, BrCl, IBr and ICI are all linear in structure. Electronic structure of Chlorine atom, in the ground state and hybridised state is represented as in Fig. Although the spatial arrangement of the four electron pairs (bp = 1 and lps = 3) round the central chlorine atom is tetrahedral, due to the presence of three lone pairs of electrons in three hybrid orbitals, the shape of AX molecule gets distorted and become linear. Fig. for the ClF3 molecule. Bipyramidal structure arises out of sp3d hybridisation involved in the formation of this compound, as illustrated in the Fig.. The three dotted arrows indicate electrons contributed by the three fluorine atoms (without lone pair it is T-shaped). 3. Type AX5 (IF5, BrF5, etc.) These compounds are formed by sp3d2 hybridisation and hence have an octahedral structure, as shown in Fig. for the formation of IF5 molecule (without lone pair it is square pyramidal). 4. Type AX7 (IF7). This compound has a pentagonal bipyramidal structure since this is formed by sp3d3hybridisation. anomalous behaviour. A reacts with water forms a mixture of B, C and acid D. B and C are allotropes. A also reacts with hydrogen violently even in dark togive an acid D. Identify A,B,C and D. write the reactions. Therefore, B is Oxygen and C is Ozone. iii) Fluorine reacts with hydrogen to give D.